Downtown Cairo's urban heritage is undeniable, but with decades of deterioration, can artists play a meaningful role in its regeneration? The Downtown Contemporary Arts Festival (D-CAF) starting this weekend is not merely an opportunity to catch a few shows and indulge in culture from all over the world, but is actually a tool to bring people to Downtown Cairo. The main sponsor of D-CAF is Ismailia for Real Estate Development, spearheaded by Karim Shafei. The company has been on a mission since 2007 to buy out property in Downtown Cairo and refurbish the buildings to address the many structural issues that exist, and rent out these different spaces to not only residents, but also for cultural activities that attract a broad spectrum of society. The company has acquired 20 buildings to date, and aims to attain more after Egypt’s financial crisis subdues. As the acquisition and renovation phase of the project continues, Ismailia is supporting various cultural initiatives by offering spaces for free or at a subsidised rent. This model opens many points of critical discourse among investors, urban planners, artists and observers. The reality of Downtown Cairo and the history of its disintegration over the past years cannot be simplified and needs extensive studies. Its also needs to address the question of whether independent artists are taking part in a gentrification of downtown or not, and how can the investors, artists, and all other stakeholders make sure Downtown Cairo remains a centre for the entire city, and not just one socio-economic class. Finally, it is important to address what kind of mechanisms need to exist in order to develop the downtown independent art scene across its disciplines. What role investors, government, civil society and other private sector bodies need to play to achieve a holistic developmental vision of the heart of Cairo. Ahram Online had extensive conversations with an array of stake holders in this issue including: CEO of Ismailia Karim Shafei; director of D-CAF and Studio Emad El-Din, Ahmed El-Attar; urban planners Omar Nagati and Mohamed Elshahed, and art space managers and artists Tamer El-Said from Cimatheque and Heba Nawara from 10 Mahmoud Bassiouny. One of Cairo's oldest neighbourhoods, built between the 1900s and 1920s, was once known for its elegance, stunning architecture and for being the shopping and entertainment centre of the city. Over a few decades, it transformed into a dusty, run-down neighbourhood with almost empty buildings; a hub for street vendors and a space for occasional violent political rivalry. The transformation of Khedevi Ismail's contribution to Cairo started with The Free Officer's movement, the 1952 coup d'état that saw a wave of nationalisation all over the country. The government acquired more than half of the 450 buildings that constitute Downtown Cairo, with about a hundred buildings later returned to their rightful owners, leaving those and all the rest with a poor rent and ownership model. This approach by the government kept rent stagnant since the 1950s ignoring the high rate of inflation that would overtake the country. With the Open Door policy of the 1970s, many of the cafes, restaurants and bookstores that saturated Downtown Cairo, started turning into shops selling imported goods. The neighbourhood quickly became overly crowded, along with the deterioration of buildings, because the owners over generations became too many, "sometimes up to 40," to run them due to inheritance laws, according to Shafei. The owners also made practically no money to be legally required to spend on their maintenance, leading the upper-middle classes and upper classes to opt for leaving the neighbourhood. "There is a major problem in Downtown, which is the socio-economic structure of it," urban planner Elshahed said. "The real-estate is obviously built for a certain income level. Then, a transformation happened, but this transformation didn't match the available space." Elshahed explained most of the apartments are used for activities that do not work for the spaces, such as a shoemaking workshop, warehouses, storage spaces or small factories, since these are the activities that can be done under such living conditions of the buildings' poor maintenance. A lover of Downtown Cairo, Shafei told Ahram Online that an idea to buy one building in Downtown with some friends as a long-term investment, turned into the company, as we know it today, when they found tens of building owners who wanted to sell the buildings. Shafei attributed this willingness to sell due to all the rent control and inheritance issues of Downtown. Their vision was to attract a positive traffic to Downtown and bring back tenants from the social segments that had evacuated Downtown Cairo over the decades. "We think arts and culture attract a very positive traffic," he said, commenting that arts and culture activities are non-discriminatory, therefore can attract a socio-economic wide spectrum of people. From there, Ismailia started renting out spaces for artistic purposes. At the moment, they are renting to Townhouse Gallery, Contemporary Image Collective, 10 Mahmoud Bassiouny, and a shop front on Mahmoud Bassiouny Street to Ganzeer. They also give spaces on temporary basis for music video shoots, workshops and exhibitions such as Hotel Viennoise. "The financial support is important and makes a huge difference for an independent art space," said artist Nawara. "Also, it's much easier for me to rent from a company like Ismailia than from a random landlord," she added, explaining that her project and Ismailia share a goal to both attract people to Downtown and the art scene in general, who do not normally frequent either. Over the past ten years or so, Downtown Cairo has been the centre of the independent art movement. While art spaces exist in other areas in the city, Downtown Cairo has been the hub for this social movement, on a cultural and political level. According to El-Attar, director of D-CAF festival, people come to Downtown to look for something different, something alternative from the mainstream culture. "Art moves stagnation. Downtown has been experiencing that in the decade before the revolution with the network of spaces," said Nagati, adding that with Downtown's diverse social makeup, the diversity of class and culture creates a good model of co-existence. El-Said echoed this statement saying, "The social and cultural movement [currently] happening promotes polarisation," explaining that this goes against what any dictatorship wishes for its people. "Downtown should be the place that answers this question; it should be a place that has the space for inclusivity because this is what we need right now." 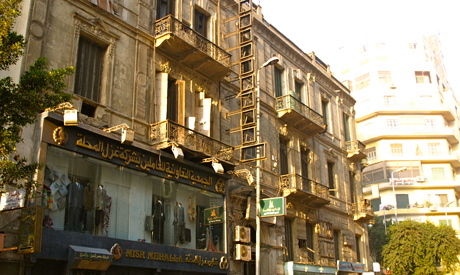 While the artists are benefiting from the support by Ismailia, there have been criticisms to this model in the media, and social circles, accusing the company of attempting to gentrify Downtown Cairo; a process which has been used in many countries to drive lower-income level communities from a place to make way for higher-income level residents and business. Elshahed does not believe that this applies, "Merely 20 percent of Downtown apartments are populated. We are talking about a place which is depopulated due to reasons that have accumulated over 40 years." Nagati agrees. However, they are concerned that without proper safeguards of policies to ensure diversity of income and culture in the area, this process could lead to gentrification. "These debates we are doing are very important to come up with policies to allow for regeneration while avoiding gentrification," he stated. Shafei has the same concern. Nagati and his business partner Beth Styker at Cairo Laboratory for Urban Studies, Training and Environmental Research (CLUSTER) initiated a panel discussion last December in Goethe Institute 'Artists as Urban Catalysts in Downtown Cairo' to discuss these concerns with real-estate owners, such as Ismailia and the American University in Cairo (AUC), and various art space representatives such as Townhouse, Contemporary Image Collective, and Cimatheque. From the many heated discussions that took place, an idea came that this relationship between the downtown real-estate investors and art spaces, needed a mediating body – an independent art council. The council's role would be to support the sustainability of art spaces and the growth of the scene in general, with funds, spaces, and encouraging collaboration over competition within the small scene. From the artist's side, both Nawara and El-Said welcomed this idea. Nawara believes this council needs to work on the attitudes of the people who run the art spaces to encourage collaboration, proper mapping and synchronisation of artistic events and activities. With a firm conviction in the importance of art for all the other stakeholders in Downtown Cairo, El-Said wants artists to be the ones who take initiative for this body to exist and put forward the suggestions to the stakeholders, not solely react. Shafei supports this idea, but wants to take it even further by establishing a board of trustees for Downtown Cairo as a whole. He describes it as "a very strong lobby group for Downtown, looking at the area from an urban, economic, cultural, social and environmental point of view." While El-Attar does not believe that artists should be burdened with the development in Downtown Cairo, he asserts that they are an integral part of this development. "Any development is an organic thing; the government is involved with all its branches along with artists, businesses and civil society. This development needs a lot of involvement and negotiation not just for it to happen, but so it lasts. We need the kind of social movement that pressures the government to take part in this process," he said. With the right direction and development Downtown Cairo could easily become the center for the independent art scene in Egypt and possibly the region. With its nostalgic buildings diverse population and room for growth, whats to stop it from becoming the brooklyn-esque location of Cairo? It would be a wonderful boost to society, morale and Egypt's image to create a visible, physical location to host Cairo's vibrant, creative, artistic and expressive minds. Can't wait to see how it turns out & to see more from the artists. Pics, please!